replacementsltd has no other items for sale. 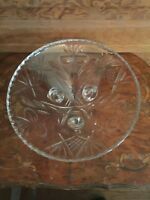 LARGE LEAD CRYSTAL CENTERPIECE/ Serving Bowl FOOTED BOWL 9.5" Rnd MINT CNDTN! VIDALI COLLECTION Crystals Mirror Wedding Centerpiece Vanity Perfume Display 11"
$0.00 shipping for each additional eligible item you buy from replacementsltd, when you use the cart to make your purchase. Sales tax may apply when shipping to: AL*(5.0%), AR*(6.5%), CT*(6.35%), GA*(6.0%), HI*(4.0%), ID*(6.0%), IL*(6.25%), IN*(7.0%), IA*, KS*(6.5%), KY*(6.0%), ME*(5.5%), MD*(6.0%), MA*(6.25%), MI*(6.0%), MN*, MS*(7.0%), NE*(5.5%), NV*(6.85%), NJ*(6.625%), NC*(6.75%), ND*(5.0%), OH*(6.5%), OK*(4.5%), RI*(7.0%), SC*(6.0%), SD*(4.5%), TN*(8.5%), UT*(5.95%), VT*(6.0%), WA*, WV*(6.0%), WI*(5.0%), WY*(4.0%). To receive the combined shipping rate for multiple items, please wait until you have committed to buy all of the items you want before completing the checkout process. Please verify your shipping address BEFORE submitting payment & completing checkout. Orders are automatically processed in our system and shipped to the address provided during checkout. Sorry, but we cannot ship to hotel addresses, or post office boxes in Canada or other international destinations. Thank you.